Suddenly, Queen Elizabeth I marched into her apartments, that once belonged to her father, King Henry VIII, with Thomas Dudley hot on her heels. Soon, the Scottish Ambassador on behalf of her rival, Queen Mary of Scots, would arrive and she wanted to challenge the ambassador on who was the most fairest queen of them both. It was all rather thrilling and I inched forward, hoping to get a better slice of the action like a sneaky courtier. ‘Ah, you play beautifully, your majesty!’ the thick Scottish brogue rang out into the inner sanctum of the council chambers as the Scottish Ambassador, Sir James Melville, bowed before the Queen. ‘So, who plays the lute better than I? My cousin, Mary, perchance?’ her wiles opening to catch him out in deceit as her rumoured lover, Thomas Dudley, sniggered behind the drapes listening in. I glanced at the rest of the audience, in rapt attention, as they listened in what could have been a fleeting moment in history. 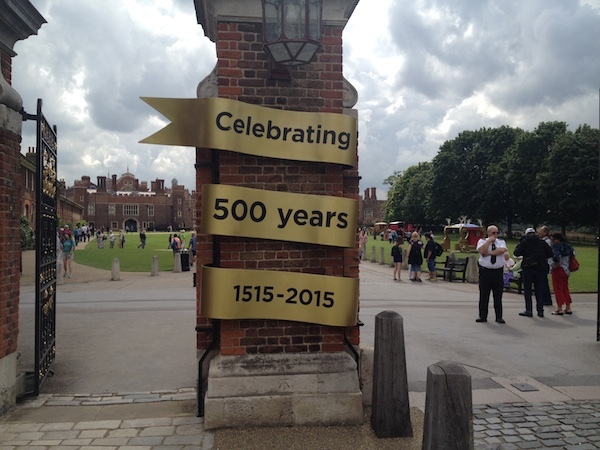 Here I was in Hampton Court Palace, south-west of London along the River Thames, and today, it was celebrating its 500th anniversary since it was built. Pretty sturdy for a palace, eh? 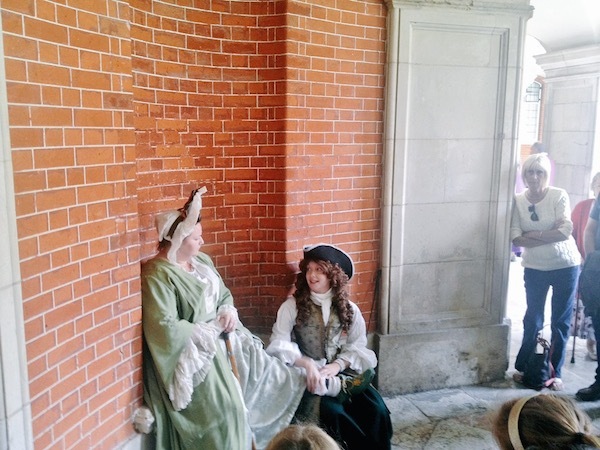 Part of the 500th anniversary celebrations is to showcase ‘time plays’ where actors play out key moments in Hampton Court Palace’s history. And to be honest, it was truly inspired. Here, history comes alive for all ages and all generations and you simply have to watch all of them watching with keen interest of what outcomes would result, changing the course of British history or perhaps even the world. ‘Ah, Your Majesty, the English Queen is fairest in England, and my Queen is the fairest in Scotland,’ the Scottish Ambassador looked to us, pleased at his diplomacy. Unfortunately, Elizabeth was not satisfied, giving rise to chuckles across the audience. 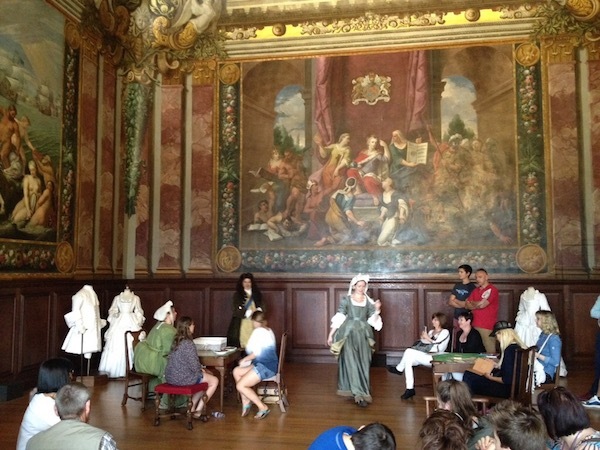 This would be one of the many time plays throughout the day within different corners of Hampton Court in each different apartments whether they were King William III’s, King Henry VIII’s or even any other monarch’s. But my favourite time play definitely has to be Queen Anne’s. Preparing for her favourite past-time, hunting, she speaks with her mistress of the horse, lamenting the loss of her 18 children and pregnancies thus ending her Stuart dynasty. But she remains fiercely proud of her country, hoping to steer it to its eventful empire that will expand over a quarter of the world within the next century. 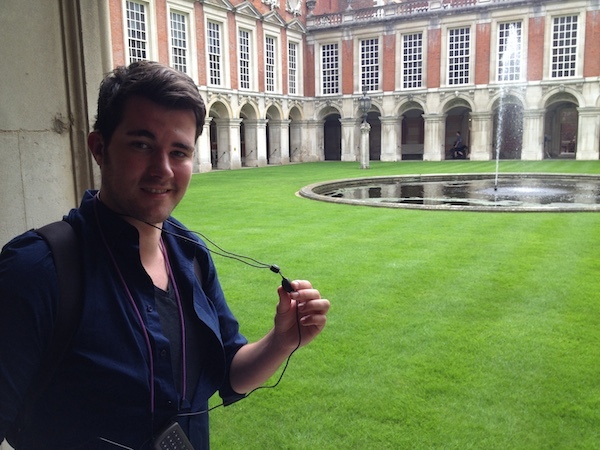 I had been to the front of Hampton Court Palace before in March before exploring its gardens for an hour on the day after the Traverse conference in Kingston Upon Thames further down the river. Taking a Turks Cruise, I soon resolved to return to this Royal Historic Palace and explore within for a good long day. 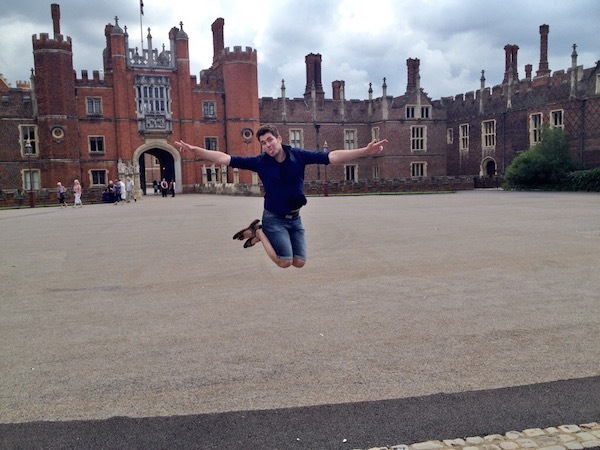 I explored Hampton Court Palace for FIVE hours and there were more things to explore! Discovering the palace pleased my royal history geek within and I could finally visit my first Royal Palace! Some of the gardens has free entrance so you’re welcome to check out the orchards and the Royal Park. 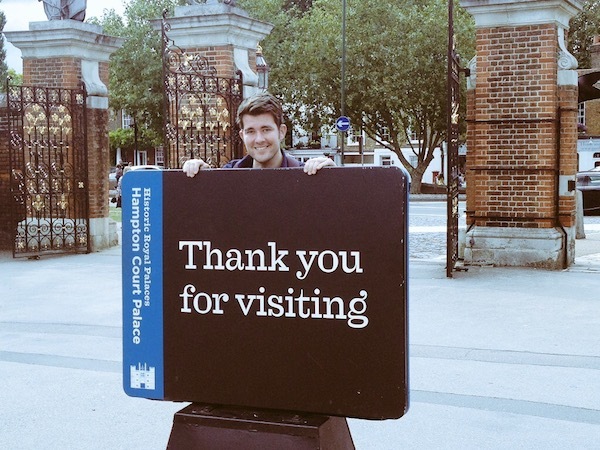 However, if you want to go inside the Palace and the beautifully laid out gardens, you will need to pay entrance. But let me tell you this, it’s completely worth it! I was itching to go inside the Palace itself so I promptly went through and thus seeked out any audio support for my deafness. Luckily, for me, there were T-coil neck loops available, which I could set my hearing aids to. However, it became clear that the neck loops have been used extensively thus they were not as powerful as they once was before. As a result, I had to thread the neck loop over my ears to get the best quality, which still wasn’t good. I gave up after half an hour and returned it, opting to sightsee without any guides. 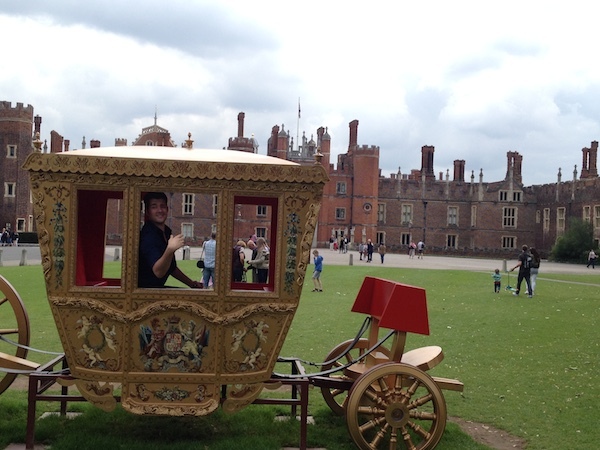 However, I still was more than happy about my experience in Hampton Court Palace and quickly starting following the time plays around! First of all, we went into King Henry VIII apartments, offering medieval delights including a banqueting hall and long stretching corridors filled with grandiose paintings and murals. The Queen’s Staircase was a personal highlight, its marble strewn steps overawing the tourist. It also acts as a focal point to go into other apartments including the Georgian Story Apartments, which I really enjoyed exploring. I confess, I don’t know much about the Georgian Period until Queen Victoria and the warring fathers and sons within the Georgian dynasty quite repelled me before. However, Hampton Court Palace did a grand job on drawing me into the history of the Enlightenment and the Glorious Revolution. So much so, I bought a book about the Georgians in their gift shop afterwards! After a couple of hours of exploring the apartments and the Fountain Court, fresh air was needed. 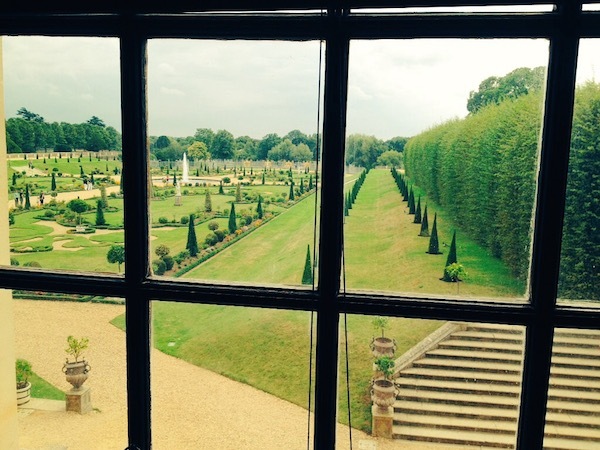 Enter the beautiful private gardens of Hampton Court Palace! It’s a gorgeous place to grab a locally made ice-cream and sit on one of the many deck chairs strategically placed around the gardens. For my friend and I, it was a good chance to give our feet a rest! 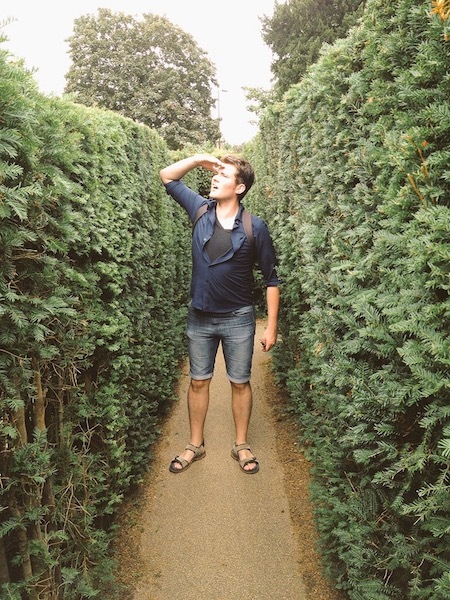 But time waits for no man to explore 500 years of history, so we thought we could escape it for a while in Hampton Court’s very own maze of hedges! How long do you think we were trapped in there for? Hours? Actually, it was ten minutes. I have a secret how to get our mazes and it completely worked. And no, I’m not telling you. But it was all good fun and you could hear the delights from people exclaiming, trying to work their way out on this sunny Sunday afternoon. Afterwards, it was back into the Palace for the rest of the afternoon. I met even more royals including King Charles II, King George I and King George II in even more time plays, some comedic and some tragic. King William III’s apartments were my personal favourite, I do have to think, once again exploring into the Georgian period, but the interior design was so fascinating. 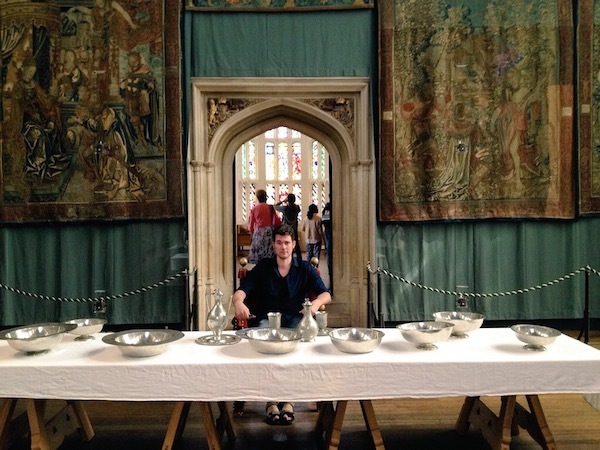 There is an exhibition on Henry VIII’s Early Story for those interested in the Tudor Period. However, as I was pretty saturated with the Tudors anyway, I became tour guide for my friend who was puzzled about the War of the Roses that preceded the Tudor period. Try explaining all those twists and turns within the thirty year war, but I think I got the message across! Soon, it was time to go and catch my train from Hampton Court back to Wimbledon. It was with a sense of regret that I felt I hadn’t explored all of the Palace but I was cheered up that I could return. 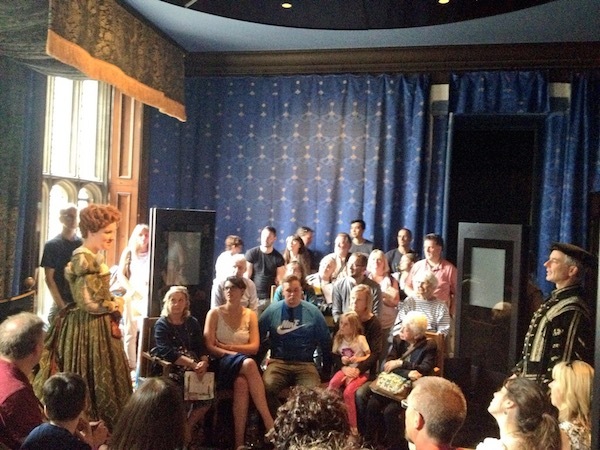 Perhaps even on one of the many exclusive events they offer such as Ghosts Tours or even outdoor cinema screenings.